There are those who say that mankind's demise has long been written. That the wind knew our story long before the fire kindled the passing of time's stark flame. Some even say that in Heaven's dark days, God and the devil had a multitude of conversations. In God's omnipotence, they struck a deal - prearranged the blame. Others will attest that free-will brought about mankind's damnation. Impurity begot the rule of darkness. Greed and pride wrought the bloodshed. Wars and famine fueled mankind's annihilation. Sloth and gluttony procured the plagues. They assert, mankind had transcended, manifested into sin-filled sheep - that they'd become demon vessels - blackened souls corrupt and stained. But, every culture bears a history. Generations spread the story: Only the chosen will find redemption. For the unrepentant - the message plain. My name is Faith Savage. I am a child of God and a hunter of demons. I am a sinner and a warrior doing God's bidding. With each night's passing, I stand against the darkness and the devil's minions, searching for my own message, my own light within this plague; praying that even I don't lose my way. In the beginning, there were those with faith. I wasn't one of them. But a troubled soul can only be tested so often and when God saves you from the darkness because he has plans for you, who are you to say no to the Lord? 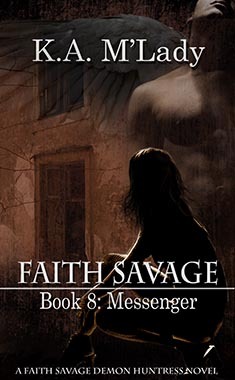 My name is Faith Savage, and I hunt demons. It's a job I've been recruited into. My payback from what could have been an eternity of suffering at the hands of the darkness. But what's a poor soul to do when Heaven and Hell change the rules, and all that is and once was angelic decide to test the boundaries of faith and temptation? Who is the soul that truly suffers, and which of God?s creatures will end in defeat? Nothing is certain...especially in war. And when that war involves Angels and the fallen and they bring it to your doorstep, sometimes all your left with is your faith..